Montelukast is a leukotriene receptor antagonist (LTRA) used for the maintenance treatment of asthma and to relieve symptoms of seasonal allergies. It is usually administered orally. Montelukast blocks the action of leukotriene D4 on the cysteinyl leukotriene receptor CysLT1 in the lungs and bronchial tubes by binding to it. This reduces the bronchoconstriction otherwise caused by the leukotriene, and results in less inflammation. Because of its method of operation, it is not useful for the treatment of acute asthma attacks. Again because of its very specific locus of operation, it does not interact with other allergy medications such as theophylline. 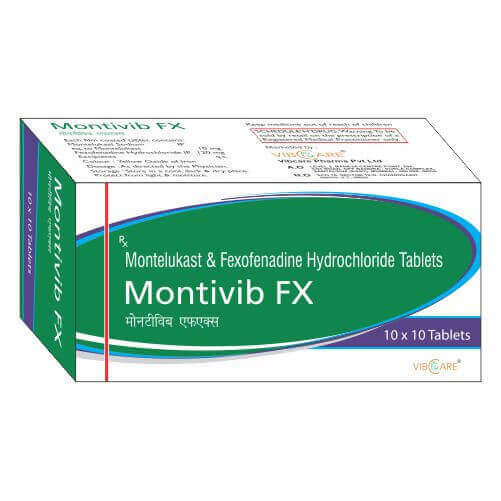 Montelukast is marketed in United States and many other countries by Merck &amp; Co. with the brand name Singulair®. It is available as oral tablets, chewable tablets, and oral granules. In India and other countries, it is also marketed under the brand name Montair&reg;, produced by Indian company Cipla. Montelukast Side effects include headache, abdominal or stomach pain, cough, dental pain, dizziness, fever, heartburn, skin rash, stuffy nose, weakness or unusual tiredness.